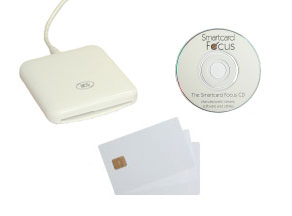 This kit is suitable for anyone looking to get started with the BasicCard range of programmable smartcards. All the required documentation and software for application development is also provided on the development CD, while further supplies of readers and BasicCard products are available from our store. The ACR38 IPC is fully PC/SC and EMV Level 1 compliant and supports all ISO 7816 microprocessor-based smartcards as well as many popular memory cards. Further supplies of all cards and readers are available from our store. Programmable card using Basic. 16K bytes application memory, 1K byte RAM. Programmable card using Basic. 8K bytes application memory, 256 bytes RAM.